As said by Janet Erskine Stuart, “Egypt is full of dreams, mysteries and memories” and with the latest invention of Fugaso completely verifies the statement. Plagues of Egypt is a perfect blend of dreams, mysteries involved in it and the memories you take away with you after playing the game. It is believed that once upon a time God send his disciple, Moses to safeguard his people and unburden them from the rock of slavery. Pharaoh was in power during that time from whom Moses had to take permission. However, the rowdy Pharaoh denied Moses request. Hence, in this anger, God sent plagues which could encourage Pharaoh to let people go. The whole game encircles around this renowned tale and is creatively designed to make it engaging and interesting for the players. Comprising of 3d graphics, the game can be played using the 5 reels available in the slot machine. Just as God sent plagues one by one, you can find them here as well popping up on the reels in the form of symbols. Some of these symbols are frogs, flies, hails, child dying, Blood Red River and many more of these to fascinate you. Wild symbol is also present as the pyramid in golden color. However, in the game, the Wilds can occur only on second and fourth reel. Substitute your desired symbol on the slot machine using the Wilds and you are authorized to win huge bonuses and reward points. Altogether there are 10 symbols available in the game that can be combined to the monarch of terror, Pharaoh himself. The bets can be placed according to the player’s wish. There are 40 pay lines present that you can select during the course of play. Lowest bets can be placed at 0.40 while the highest is at 200. In between this range, the players select a value with definite coin size to place his bet. You will be mesmerized by the animations that is completely striking and breath taking. Undoubtedly, there are wins associated with each combination that the player makes. In order to make the game more exciting for the players, Fugaso has incorporated the progressive Jackpots bonus so that the players are encouraged to play the game and earn more. Nevertheless, the Jackpot bonus is activated only after a certain level in the game with specific validations associated with it. Since Plague is present in the game, so it becomes quite obvious for the savior to be present as well to save people from the cruel Pharaoh. Check the left of the slot and you will find Moses standing reacting to each symbol. 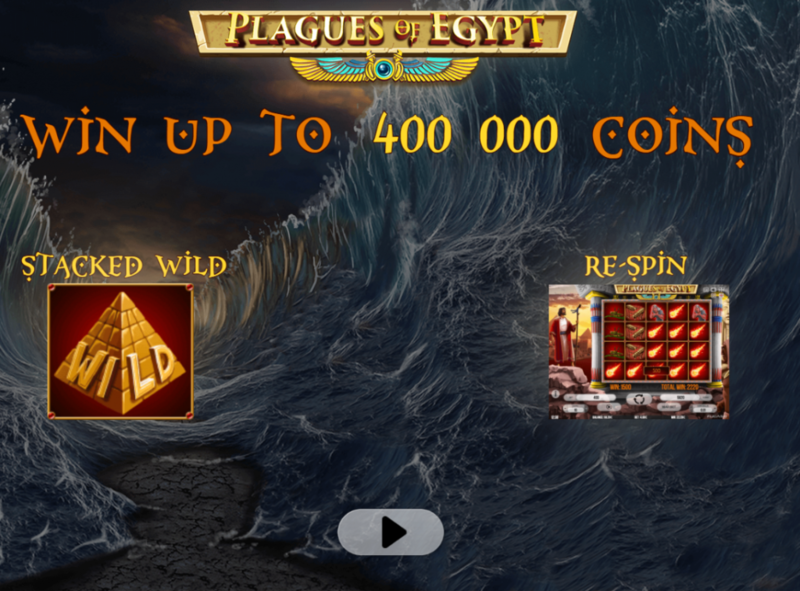 The Plague of Egypt slot can be played using both demo version as well as real cash. However, it restricts some of the bonus and rewards, such as the Wilds. Wilds can be activated only when you play with cash. In the same way, your access is denied for respin while playing in trial. Wilds equip you with the power to replace the existing symbols on the slot machine. The Wilds can expand itself and tend to cover the entire reel furnishing you with high rewards and bonuses. Furthermore, as soon as the blood red river covers all the five reels, it triggers the re-spin feature. This is definitely not enough; Furgos has integrated the scatters that could assist you in earning free spins. They can be utilized to rotate the reel with better wages and high limit stakes. Generally, the new comers of online slot games avoid placing bets with high limit because of security reasons while making transactions and deposits. Therefore, secure payment gateways with latest and efficient techniques are available that makes your deposits in the fastest manner. Any player who wishes to be a part of Plague of Egypt slot can register online through the website and start playing the game. Furgos provides 24*7 supports through its help and support center. Hence, you can get all your queries answered within no time. Plagues of Egypt hold exotic variety of surprises and rewards in its well. You only need to dig in deep to reach your destination.